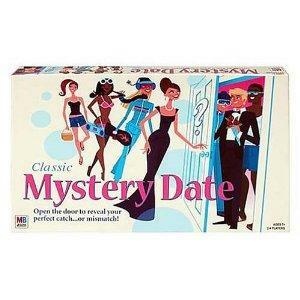 For more than forty years girls have enjoyed playing The Mystery Date Game. First introduced by the Milton Bradley Company in 1965, Mystery Date quickly became a favorite board game for many tweens and teens. Whether friends were at a slumber party or passing the time on a Saturday afternoon, there was sure to be plenty of giggles and laughter once a game of Mystery Date began. The game can be played with 2 - 4 players, and this version was recommended for girls ages six to fourteen. If the player's cards match the date that is revealed, the player wins and the game is finished. If the player's cards do not match the date that is revealed, the player keeps the cards and play moves to the next person. If the date revealed is the "dud," the player loses her cards and draws new cards from the card pile. Play moves to the next person. In 1999 Hasbro released a slightly different version of the game Mystery Date. The game included an electronic phone and had different game play than previous versions. Players receive telephone clues from twenty-four possible mystery prom dates. This is the only version of Mystery Date with an electronic phone. There are several additional versions of the Mystery Date game. They are all based on the game play of the original edition. In1860 the Milton Bradley Company began producing games in Massachusetts. The company continued to grow to become one of the biggest game companies in the country. In 1984, the Hasbro Corporation took over the company keeping the Milton Bradley brand name.